A LIFELONG COMMITMENT OF SERVICE TO OTHERS! 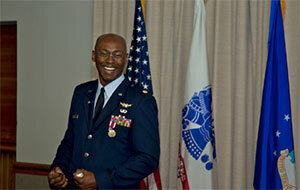 Unlike most financial advisors, JB enjoyed a 20-year military career and retired as an Air Force Major. As a mid-career officer, he would often give advice to his subordinates, peers, and his superiors on all of their financial questions. It was then that JB realized he loved helping people make sound financial decisions with their money. Today, JB continues to serve his clients and community. He’s a role model and mentors young children in underserved areas. JB is a Past President of the Financial Planning Association of Nevada and the Project Management Institute of Southern Nevada, and continues to support these and many other organizations. JB is a graduate of Leadership Las Vegas Class of 2016; and his most recent community service effort was the Buddy Bench project at Goolsby Elementary School. In his free time, JB enjoys reading, traveling, cheering for Mia’s fast-pitch softball team, and helping his 7-year old son Manning learn how to play different sports; golf, basketball, soccer, flag-football and baseball. Two of JB’s favorite past times are dressing up for Mickey’s Annual Halloween Party, and spending more time improving his golf game.